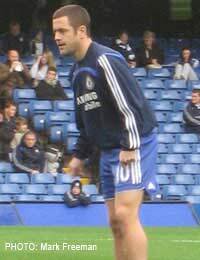 One of a group of young players who emerged from the impressive West Ham United youth development process in the mid-to-late Nineties, Joe Cole was hailed as a football genius from an early age. Alongside Frank Lampard, Michael Carrick, Rio Ferdinand, and Jermain Defoe, Cole attracted a lot of attention as a schoolboy and was considered one of the creative driving forces of the youth team, being quickly elevated to West Ham's first team. By this time Cole was well known to the England team hierarchy, having made eight appearances for the England under-21 side by then and being a squad member under Kevin Keegan. He came on as a substitute for his England debut in a friendly against Mexico in 2001 under Sven-Goran Eriksson, who had the freedom to try out young players with a view to the future, as expectations of qualification for the 2002 Word Cup were low to non-existent after a disastrous start to the campaign. As it turned out, Eriksson's young team managed to go to the World Cup, held in Japan and South Korea, after some excellent displays, and Cole established himself in the squad, mostly coming on as a sub, as he did for his only appearance in the finals, replacing Darius Vassel toward the end of the 2-2 group match draw with Sweden. Eventually going out in the quarter-finals to eventual winners Brazil, despite going into a one-nil lead, the team's achievements under Eriksson were well received back home, particularly as they hadn’t been expected to be there at all and it was widely accepted that Eriksson was building a team with the Euro 2004 and the next World Cup in mind. But Cole's club situation was going to have an unexpected impact on the part he was to play in Euro 2004. In 2003 he had been appointed West Ham's captain in the season that a mostly young team were unlucky to be relegated to the First Division, despite having the highest points tally for a relegated side in the history of the Premier League. The hottest prospects of the team were inevitable pounced upon by the top level clubs and Cole went to join former team-mate Lampard at Chelsea, newly revitalised by Roman Abramovich's billions. But under manager Claudio Ranieri, and subsequently Jose Mourinho, Cole found it hard to keep a first team place, despite his undoubted ball-playing skills and vision. Playing as an attacking midfielder rather than an out-and-out winger, he nevertheless faced increased competition for a place in the side, initially from Damien Duff and Arjen Robben and later England teammate Shaun Wright-Phillips. At the same time, he came under fire for not fulfilling his defensive duties, being reluctant to come back and tackle when required. His patchy runs in the Chelsea side, often coming on as a substitute rather than getting a place in the starting line-up, reflected in his England form. By the time the Euro 2004 finals were held in Portugal Cole had racked up 17 caps but only two of them had been as a starter, one of them a qualifier against Liechtenstein, the only qualifier he played in. It was no surprise that he didn’t play in the tournament, although he was taken as a squad player, and England again went out at the quarter-final stage, defeated on penalties by the hosts. Back at Chelsea under Mourinho, who admired Cole's skill but despaired at his inability to play the game that Mourinho wanted to see, slowly began to play him more regularly, as Cole refuted talk of a possible move and knuckled down to the hard work of proving himself. This began to pay dividends, and more regular appearances in the Premiership were echoed in a sustained run in the England side, with Cole focussing on providing the solution to England's much discussed 'left-side' problem. In the run-up to the 2006 World Cup in Germany it looked as if he had managed to achieve this as he appeared in the starting line-up for nearly all of his caps, including the matches at the World Cup. He caught the eye in particular in the 2-2 group stage match with Sweden, scoring an outrageous 35-yard volley from a corner clearance and laying on the second gaol for Wayne Rooney. Once again though, the team disappointed, repeated the Euro 2004 result by going out to Portugal in the quarter-final on penalties. A few months later, an injury sustained on a pre-season tour kept him out of action for the bulk of the 2006-07 season, but it is to his credit that he was straight back in the England side, in the left midfield position, as soon as he was fit again. England disappointingly failed to qualify for the 2008 European Championship and Cole then suffered another long term injury. If he can regain his previous playing standard he can show what he can do on the biggest stage at the 2010 World Cup. So far the conclusion has to be that he has not yet fulfilled his potential.